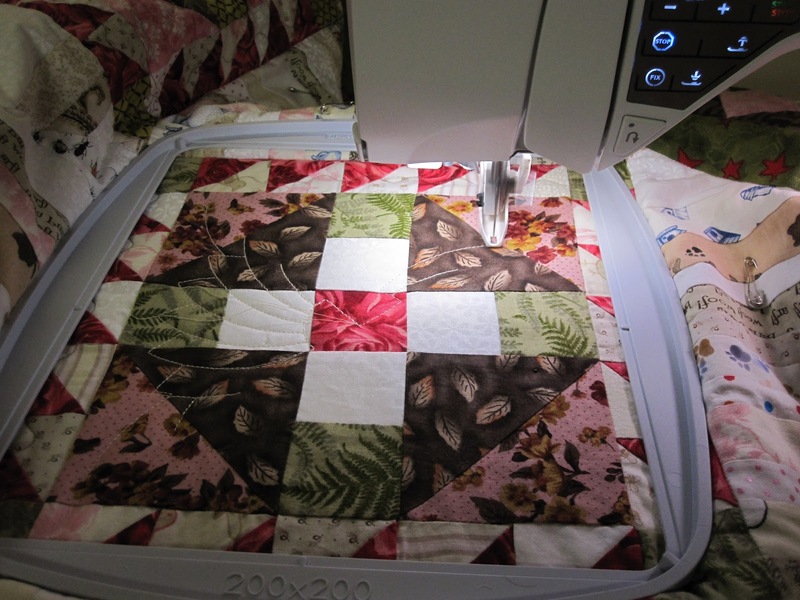 I've been diligently working on my quilt for the, Quilts on the Grand, quilt show. I started it back in Nov/Dec 2010 when my friend, Terri, asked me to join her in the Bonnie Hunter mystery quilt online. I had just lost my job so it was a perfect project to keep me busy so I didn't get depressed. Who has time to get depressed when they have to make 600 1½" half square triangles!! 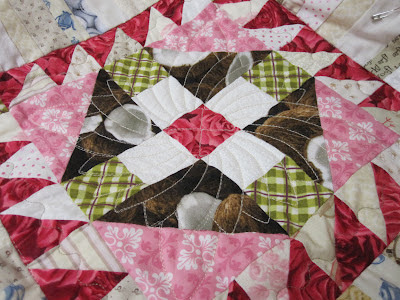 Terri and I both agreed in the beginning that we would both put our quilts in the quilt show. 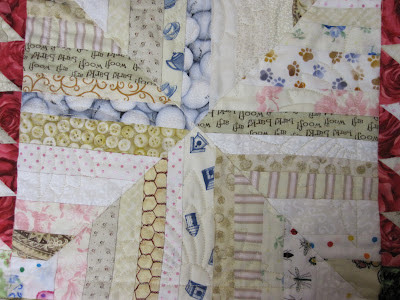 Well mine is definitely not quilt show quality, but a promise is a promise. I shouldn't have procrastinated as much and I might have had more time to fix the mistakes, oh well! I found this sunflower quilt embroidery pattern at Embroidery Library. I liked the motion the petals give, cause Bonnie named this Roll, Roll, Cotton Boll. I found it a little challenging to hoop some of the blocks in the middle of the quilt and then get the hoop on the embroidery arm with all the bulk rolled up. I had 30 of these blocks to do. Then I have 120 string pieces blocks to quilt! Most of the sting triangle blocks are in sets of four, like this. 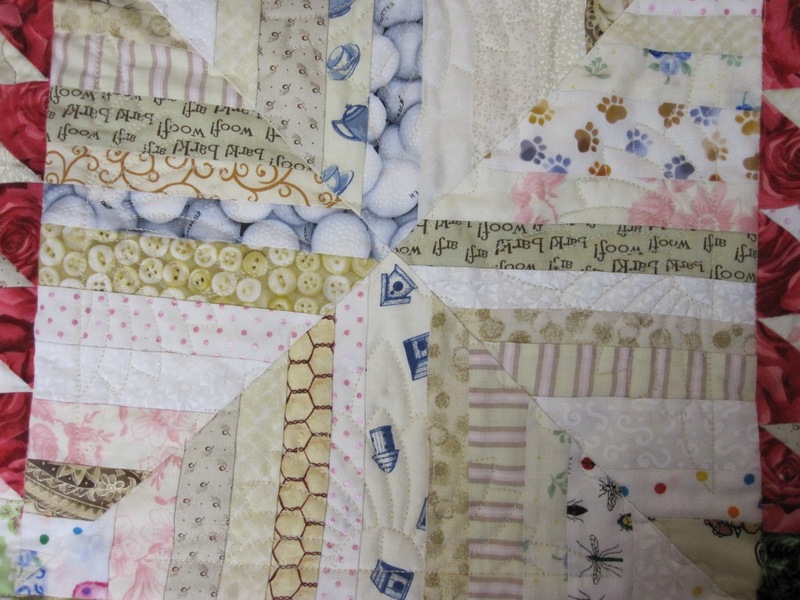 It was hard to get a picture where you could see the quilting, but its there! Then I have to tie and hide all the threads! I don't even want to do the math on that! So I keep telling myself "I'm having fun", and the good news is I believe its true!! So I'll take a nice picture when its hanging at the show to share with you, or you could come and see it in person!! Looking FAB, Bobbi! Can't wait to see it in person! !